Acharya Mahapragya is not only a spiritual leader of exceptionally high calibre but also an outstanding Philosopher Practitioner Thinker. 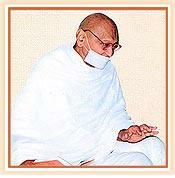 His principles on various topics like Non-Violence, Peace, Morality, Socio-Religious Harmony,Spirituality, Science of Living, Preksha Meditation, Ecology and Social Economics have inspired both the intellectuals and the common men alike. His thoughts have inspired many categories of people and have yielded Positive Thinking in all walks of life. The rare ability of analyzing anything that comes before him gives Acharya Mahapragya a vision to see beyond time. It is well foreseen by him as to what will be the expectations of the coming Centuries. He never gets carried away by problems, but rather works forward on the way to finding out their solutions. In the field of Science, Newton’s theory has been accepted for Centuries. Marx is still remembered for his Theory on Socialism. Acharya Mahapragya stands among all these and many other Philosophers who presented their unique ideas and unveiled a lot of mysteries of the Self. Personalities like Swami Vivekananda and Acharya Vinoba Bhave both knew the importance of Science and Spiritualism. The similar views were also endorsed by our former President and diligent Philosopher Sarvapalli Dr. Radha Krishnan. Acharya Shri’s extraordinary talent has presented Science and Spiritualism as supplementary to each other in all his works. His view is that Science has not destroyed Religion but has rather given it a new birth, is a completely New Theory, which has provided many new dimensions to the field of religion. He has not only given theories and ideas but also experimented upon them in a practical manner and thus brought Science and Religion together.